I got this for my soon to be son in law as a gift. I am forever finding loose bills in his pockets when I do his laundry!! And now that they're getting married and have purchased a house he'll need to be saving money!! Here's hoping this money clip will hang onto his money a little tighter for him!!!! Claims he doesn't carry a wallet as too hard on his hips - well this money clip should be the answer to his and my problems with his money!! Hope he uses it and doesn't just put in his nightstand drawer for formal occasions. A classic gift for the classy chap: an engraved silver money clip wallet. Sleek, sophisticated and perfect as a groomsmen's gift, father-of-the-bride gift or bachelor party gift. Each slim, silver clip can be personalized with up to two lines of custom text (maximum of 15 characters per line). Lightweight, durable and practical, this great gift keeps cash and credit cards safe and accessible. 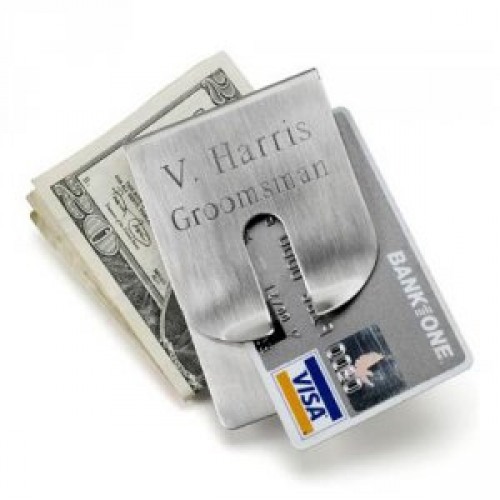 Measures 3.5"L x 2.25"W.
For more money clip possibilities, consider our monogrammed money clip wallets or engraved money holder.